In my shop, Gesine Confectionary in Montpelier Vermont, I used to make this mousse in tall cylinder cake molds, metal rings that were only about 2 inches in diameter but 4 inches tall. They were beauties. I’d fill up a serving tray with them and I had to slide them into the pastry case ever so carefully. They were so damn tall that they could easily tip over, so any miscalculation on my part would result in severing the top half of the mousse. We called them chocolate towers, of course. This is the coveted recipe. 1. 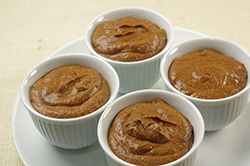 In a saucepan over low heat or in a microwave, melt the butter, making sure not to let it brown. 2. 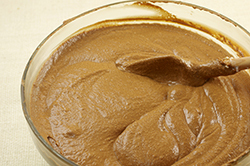 Transfer the melted butter to a large metal bowl and place the bowl over a bain-marie (simmering water in a saucepan). Attach a candy thermometer. 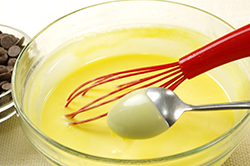 Making sure you have a whisk ready to go, add the egg yolks, 2 cups (480 ml) of the cream, 1/4 cup (50 g) of the sugar, and the vanilla extract. Whisk like the dickens, checking to make sure the temperature has passed 160°F (71°C) - it will likely reach about 220°F (105°C) due to the constancy of the heat during whisking, but you want make sure you get to at least 160°F (71°C) to kill any potential bacteria. 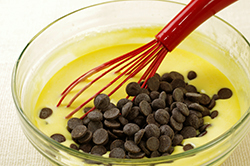 Sometimes the custard mixture appears to be “breaking,” as if the butter is separating from the cream. Don’t panic; it’ll be fine. Keep whisking until the custard mixture thickens to the point that it coats the back of a spoon. 3. Take the custard off the heat and immediately add the chocolate pieces, making sure all the chocolate is coated with hot custard. 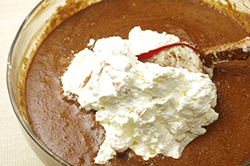 Let the chocolate enjoy the warm bath for a few minutes; then, with a clean whisk or a wooden spoon, stir until the chocolate is completely melted and incorporated into the custard. If you weren’t able to chop the chocolate into small enough pieces, you might be left with some chunks. If so, transfer the custard back to the bain-marie and stir constantly until every last piece is melted. Set the custard aside. Keep the bain-marie going. 4. 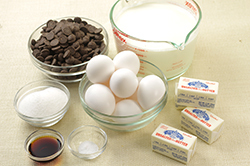 In the clean bowl of a stand mixer, combine the egg whites, the remaining 1/4 cup (50 g) sugar, and the salt. 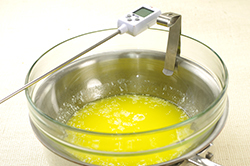 Place the bowl over the bain-marie, with the candy thermometer attached (make sure you’ve cleaned it very well since you used it last—even a tiny amount of fat introduced into the egg whites will keep them from whipping). Whisk (with a clean whisk!) 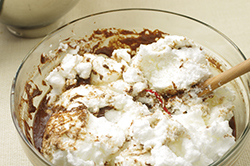 the egg whites constantly until the sugar is completely melted and the temperature reaches 160°F (71°C). 5. Immediately transfer the bowl to the stand mixer and, with the whisk attachment, beat the mixture on a high until it achieves soft peaks. Don’t overbeat the egg whites. You don’t want lumpy and dry—you’re going for soft, shiny peaks. 6. 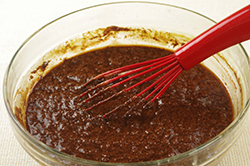 With a rubber spatula, transfer about one quarter of the beaten egg whites into the chocolate custard and stir vigorously to combine the two. 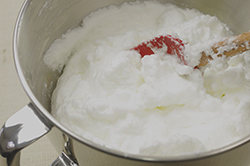 Transfer the remaining egg whites into the custard, and this time gently fold the egg whites into the custard, using the flat rubber spatula in sweeping motions like a gentle oar and turning the bowl as you go. 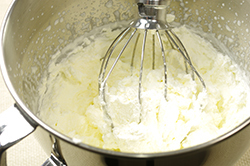 This is to maintain as much of that airy texture in the egg whites as possible. At this stage, don’t be panicked if there are still bits of egg white not fully incorporated. Set the mixture aside. 8. Gently fold the whipped cream into the custard mixture until there are no white streaks of either egg white or whipped cream remaining. 9. 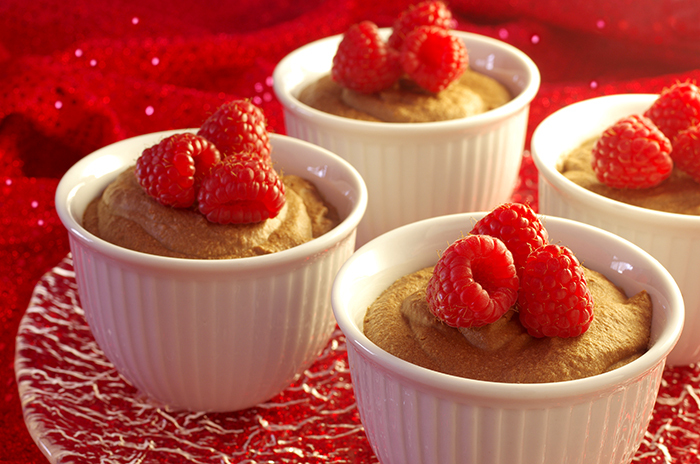 Distribute the mousse evenly into 8 single-serving bowls to chill, for 4 hours or overnight, before serving. Recipes from Sugarbaby by Gesine Bullock-Prado. Published by Stewart, Tabori & Chang, an imprint of ABRAMS, New York, NY. Copyright 2011. Reprinted with permission of the publisher. All rights reserved.